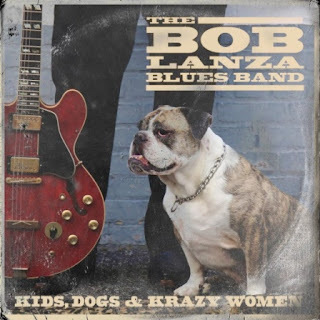 HOUSTON, TX – Connor Ray Music announces an August 31 release date for Kids, Dogs & Krazy Women, the new CD from New Jersey-based blues guitarist Bob Lanza and his band. Kids, Dogs & Krazy Women is Bob’s fifth album release. Digital pre-release sales start July 31. Bob and the band will celebrate the new album’s release with a special CD party and show on Saturday, September 29, at the legendary Stanhope House, 45 Main Street, Stanhope, New Jersey. Kids, Dogs & Krazy Women has been a long time coming. Working with acclaimed producer and performer, Anthony Krizan (Spin Doctors, Noel Redding, Lenny Kravitz), at his Sonic Boom Recording Studio in Raritan, New Jersey, Lanza delivers a mix of covers and originals, done only the way he can do it. The album also includes a tribute to the late, great harmonica master, James Cotton, penned by Lanza and Krizan. As fate would have it, the two would hook up on a landscaping job. They were doing labor for a mutual friend, who said he would love to hear Anthony and Bob playing together. With that thought in mind, they both continued with their respective bands, doing gigs around the area, crossing paths here and there. Two years later, this past March, the two guitarists would end up on the same bill, a fundraiser for the Jersey Shore Jazz and Blues Foundation. A resulting jam at the end of the show presented the opportunity for them to play together, and it sounded as if they were playing together for years. “That day I asked Anthony if he’d be interested in recording us,” Lanza recalls. Krizan didn’t hesitate and two weeks later, Lanza would bring his rhythm section, Vin Mott and Dave Lockhart, to Sonic Boom Recording Studio. "Right from the start, we knew we had some great stuff going on,” says Lanza. Joining the two guitarists are John Ginty on Hammond B3 organ and piano, Vin Mott on harmonica and drums and Dave Lockhart on bass. The session resulted in some real raw blues, with Krizan adding haunting slide guitar, pushing Lanza's guitar playing and singing to another level. Amplifiers were everywhere: Krizan’s coveted 1964 Super Reverb, as well as two old Gibson amps, are on full display on this disc. In the guitar department, Lanza’s 1966 Gibson 345 and his 1968 thin line Telecaster, along with Krizan's TV yellow 1960 Les Paul Special (responsible for the killer slide work on the title cut) and some choice vintage Telecasters all make their presence known. “Man, Anthony really hit the note on that one” says Lanza, referring to the slide solo on the title cut.